Sand production is a major challenge that engineers face during drilling and well completion operations in the oil & gas industry. Production of sand occurs due to earth stresses and additional stress caused by the drilling activity. This breaks down the rocks comprising crude oil and natural gas. This is prominent in unconsolidated rock formations. The produced sand erodes equipment, creates down-hole cavities, and blocks tubing. This can hamper the production process. In certain cases, the casing can collapse due to sudden and extreme changes in pressure and stress during drilling operations. Additionally, down-hole equipment can deteriorate due to the accumulation of sand. In extreme cases, the accumulation of sand can result in severe blowout. Ensuring sand-free crude oil and natural gas production is critical to the effective maintenance of well productivity over an extended period of time. Production of sand while drilling adversely impacts well operations. Therefore, sand control systems play an important role in the proper functioning of a well. Based on technique, the global sand control systems market has been segmented into gravel packing, standalone screens, resin coated gravel, plastic consolidation, and others (including rate exclusion and high energy resin placement). Gravel packing was the dominant segment of the global sand control systems market in 2018. Any type of well of any deviation can be easily accommodated and gravel packed. Large numbers of petroleum companies are using this sand control technique in majority of wells across the globe. This technique is expensive, but effective when properly implemented. It is also considerably flexible. Standalone screens is another commonly employed technique for sand control globally. However, the technique needs to be customized as per specific well requirements. Based on application, the global sand control systems market has been bifurcated into onshore and offshore. Onshore was the dominant segment of the global sand control systems market in 2018. The segment is projected to expand at a moderate pace during the forecast period. The offshore segment is expected to expand rapidly during the forecast period due to the rise in offshore drilling activities across the globe. The number of offshore wells drilled in 2018 were more than those drilled in 2017. In terms of well completion, the global sand control systems market has been segregated into open hole and cased hole. Cased hole was estimated to be the dominant segment of the global sand control systems market in 2018. The open hole segment is expected to gain momentum during the forecast period. This can be attributed to the rise in usage of open hole completion in offshore applications. Open hole well completions are being increasingly adopted in deep water and offshore oil projects due to the rise in need of reliable installations and to ensure productivity of wells for a large period of time. Well intervention is not cost-effective in case a well produces sand in offshore applications. Therefore, sand control systems are increasingly being employed in open hole well completions. Based on region, the global sand control systems market can be classified into North America, Europe, Asia Pacific, Middle East & Africa, and Latin America. Middle East & Africa is the largest producer of oil and gas in the world. This is driving the sand control systems market in the region. The sand control systems market in Middle East & Africa is estimated to expand at a rapid pace during the forecast period. The market in Asia Pacific and Latin America is projected to expand at an above average pace during the forecast period. North America and Europe are also the key producers of crude and natural gas in the world. Demand for sand control systems is expected to rise at a moderate pace in these regions during the forecast period. New crude oil and natural gas discoveries and high potential reserves create opportunities for companies operating in the sand control systems market. These new oil and gas discoveries require sand control systems to manage and prevent wells from producing sand. Therefore, newly discovered and potential oil & gas reserves are estimated to create lucrative opportunities for the sand control systems market. The global sand control systems market is oligopolistic. It is dominated by large-sized players specializing in sand control and other oil-field related services. 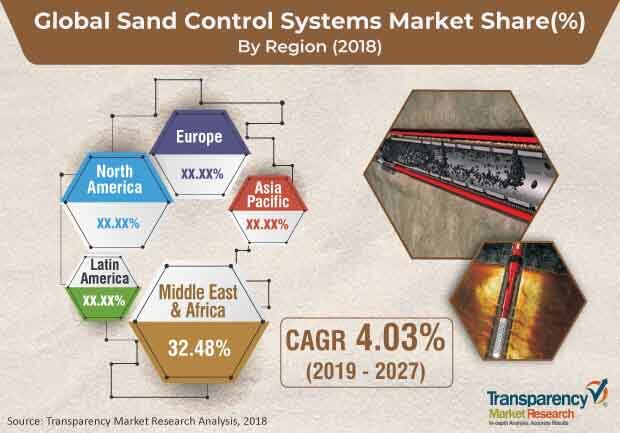 Key players such as Schlumberger Limited, Baker Hughes, Inc., Halliburton Company, and Weatherford International Limited dominate the sand control systems market. These companies possess high technical expertise. Other players operating in the sand control systems market include Grit Industries, Inc., RPC, Inc., Superior Energy Services, Inc., Variperm Limited, and Welltec A/S. Sand production is a major challenge that engineers face during drilling and well completion operations in oil & gas industry. Production of sand occurs due to earth stresses and additional stress caused by the drilling activity. This breaks down the rocks comprising crude oil and natural gas. The issue is more prominent in unconsolidated rock formations. The produced sand erodes equipment, creates down-hole cavities, blocks tubing, and thus can hamper the production process. In certain cases, the casing can collapse due to sudden and extreme changes in pressure and stress during drilling operations. Additionally, down-hole equipment can deteriorate due to the accumulation of sand. In extreme cases, the accumulation of sand can result in severe blowout. Ensuring sand free crude oil and natural gas production is critical to maintain well productivity over extended periods of time. Based on technique, the global sand control systems market has been segmented into gravel packing, standalone screens, resin coated gravel, plastic consolidation, and others (including rate exclusion and high energy resin placement). Gravel packing was the dominant segment of the global sand control systems market in 2018. Any type of well of any deviation can be easily accommodated and gravel packed. Large numbers of petroleum companies are using this sand control technique in majority of wells all across the globe. Standalone screens is another commonly employed technique for sand control globally. Based on application, the global sand control systems market has been divided into onshore and offshore. Onshore was the dominant application segment of the global sand control systems market. The segment is projected to expand at a moderate pace during the forecast period. The offshore segment is anticipated to lead the expansion of the sand control systems market owing to the rise in deep and ultra-deep water exploration activities. Based on well completion, the global sand control systems market has been segregated into open hole and cased hole. Cased hole was the dominant segment of the global sand control systems market in 2018. The open hole segment is expected to gain momentum during the forecast period. This can be ascribed to the rise in usage of open hole completion in offshore applications. Increase in number of offshore drilling and exploration projects is estimated to fuel the open hole segment during the forecast period. Based on region, the global sand control systems market has been classified into North America, Europe, Asia Pacific, Middle East & Africa, and Latin America. Middle East & Africa was the leading region of the sand control systems market in 2018. It is the largest producer of oil & gas in the world. This is driving the sand control systems market in the region. The sand control systems market in Middle East & Africa is estimated to expand at a fast pace during the forecast period. The market in Asia Pacific and Latin America is expected to expand at an above average pace during the forecast period. North America and Europe are also the key producers of crude and natural gas in the world. Demand for sand control systems is anticipated to rise at a moderate pace in these regions during the forecast period. The report analyzes and forecasts the sand control systems market at the global and regional levels. The market has been projected in terms of revenue (US$ Mn) from 2019 to 2027. The study includes drivers and restraints of the global sand control systems market. It also covers the expected impact of these drivers and restraints on the demand for sand control systems during the forecast period. The report also highlights growth opportunities for the sand control systems market at the global and regional levels. The report comprises a detailed value chain analysis, which provides a comprehensive view of the global sand control systems market. Porter’s Five Forces model for the sand control systems market has also been included to help understand the competition landscape. The study encompasses market attractiveness analysis, wherein technique, application, and well completion segments have been benchmarked based on their market size, growth rate, and general attractiveness. The study provides a decisive view of the global sand control systems market by segmenting it in terms of technique, application, well completion, and region. These segments have been analyzed based on present and future trends. Regional segmentation includes current and future demand for sand control systems in North America, Europe, Asia Pacific, Latin America, and Middle East & Africa. The report also covers individual technique, application, and well completion segments of the market in all the regions. The study includes profiles of major companies operating in the global sand control systems market. The global sand control systems market is dominated by large players. Key players operating in the market are Schlumberger Limited, Baker Hughes, Inc., Halliburton Company, Weatherford International Limited, Grit Industries, Inc., RPC, Inc., Superior Energy Services, Inc., Variperm Limited, and Welltec A/S. Market players have been profiled in terms of company overview, business strategies, and recent developments. The report provides the estimated market size (in terms of value) of the global sand control systems market for the base year 2018 and forecast from 2019 to 2027. Market numbers have been estimated based on technique, application, well completion and region. The market size and forecast for each technique, application and well completion segment have been provided for the global and regional markets.